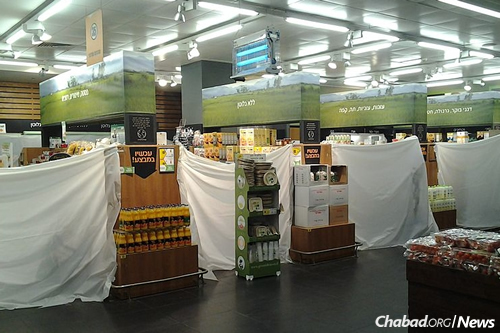 A Jewish-owned supermarket hides leavened goods it has sold for the duration of Passover. The products will be repurchased after the holiday. About 1 million people worldwide will sell their chametz this year via their local Chabad rabbi, in person or via mail. Chabad.org expects to have nearly 90,000 people sell chametz through the site. When it comes to celebrating Passover, many are familiar with the rules to avoid eating chametz—foods made with grains that leaven, or rise, such as bread, pasta and cereal. But more than that, Jews are supposed to get rid of all chametz in their homes, offices and even cars, and are not permitted to own any leavened products throughout the eight days of the holiday. To ensure that no leaven remains in one’s legal possession during the holiday, the practice of mechirat chametz, or “selling of chametz,” to a non-Jew was instituted. Historically, Jews would sell whatever chametz they had left as Passover arrived, with no plans to retrieve it afterwards. In the 17th century, the tradition evolved slightly, allowing Jews to buy it back after the holiday was over. The practice was instituted to ensure that Jewish business owners who owned chametz would not lose their livelihood. Today, the practice remains much the same, with a local rabbi serving as the intermediary and arranging for the sale of people’s leavened goods. “The rabbi will act as an agent and sell the chametz on your behalf in a legally binding sale, and he will buy it back as soon as Passover is over,” says Chani Benjaminson, a Chabad.org editorial staff member and co-director of Chabad-Lubavitch of the South Coast in North Dartmouth, Mass., with her husband, Rabbi Aaron Isaac Benjaminson. Traditionally, the head of the household meets in person with his (or her) local rabbi, who then arranges for the sale of foodstuffs to a non-Jew. And a substantial 1 million people around the world will sell their chametz via their local Chabad-Lubavitch rabbi, either in person or via mail. 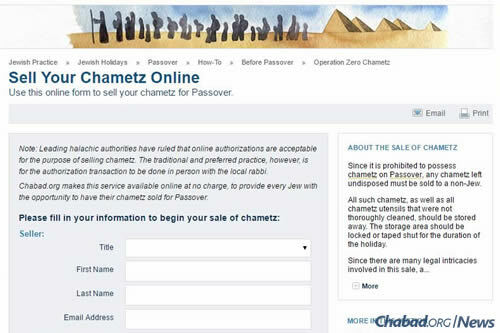 Yet as with most things these days, selling chametz can be done on Chabad.org with just a few clicks of a mouse. Chabad.org expects to have nearly 90,000 people selling their chametz through the site this year. The site is also the creator of a widely popular suite of Jewish apps, including the “Passover Assistant” app, from which more than 5,000 are expected to sell their chametz. Chabad.org makes it easy to sell one's chametz online. Leading halachic authorities have ruled that online authorizations are acceptable for the purpose of selling chametz. The traditional and preferred practice, however, is for the authorization transaction to be done in person with the local rabbi. “Selling chametz online is a great tool for people who don’t have access to a local rabbi who can sell it for them, as well as for those who are bedridden or otherwise unable to sell it in person,” says Benjaminson. And it’s easy to do. “It only takes a couple of minutes. You fill out the online form, where you will be asked to enter your name and email, as well as the address of the chametz you are selling,” she explains. “You will then select the time zone from a list of locations and click on ‘continue’ to finish the sale process. The resurgence of the sale of chametz is linked directly to the global Passover campaign launched in 1954 by the Lubavitcher Rebbe—Rabbi Menachem M. Schneerson, of righteous memory. The Rebbe encouraged Jewish leaders to distribute handmade, round shmurah matzah to families and individuals for use at their seders, create model seders, invite millions to public seders, organize the sale of chametz for people in their communities and more. Beginning in the late 1950s, this tradition was encouraged and made available by sending brochures to Jewish homes and communities via mail. In the late 1980s, the sale of chametz was made available via listserv and email; in 1995, it was made available online. The sale of the non-Passover food must be completed Friday morning, April 22. Check the Chabad.org calendar or a local rabbi for the time near you. The online form should be completed by 8 a.m. to ensure that the sale is made. Friday morning also marks the time to burn 10 small pieces of bread, called biur chametz, to show that Jews have ridden themselves of anything leavened. While unleavened items can be consumed once Passover is officially over, Benjaminson suggests that people give their rabbis at least an hour to buy back the food before heading towards that favorite but recently forbidden stash of snack foods. “You can use the time to put away your Passover dishes,” she says, knowing that post-Passover kitchen cleanup will take at least that much time (adding good-naturedly, “and probably much more”). To arrange for an online chametz sale, visit the Chabad.org page here.